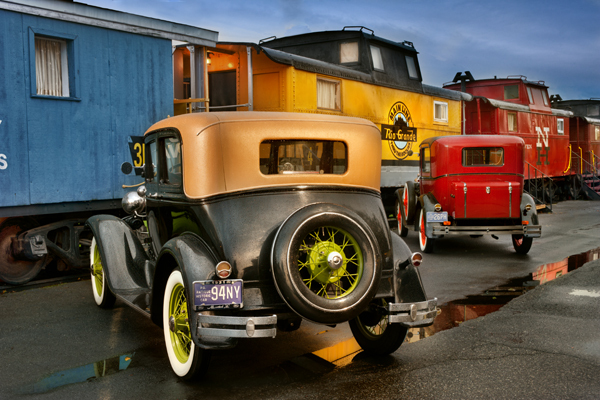 These old cars were part of a car club that was out touring the farm country,and I happened to spot them parked at a motel that is totally comprised of train cabooses. Each guest spends the night in his very own caboose, which come in every color under the sun. The evening was basically pouring rain,but after shooting under an umbrella for 30 minutes,the rain stopped and I began lighting the scene with flash. I thought the two modes of transportation complemented each other and harkened back to a simpler time.The yellow caboose is the Rio Grand.